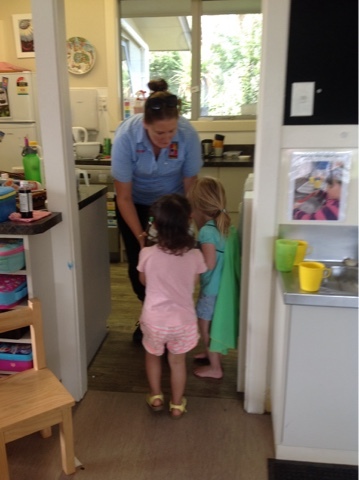 Over the week Jessica had been sharing one of her favourite songs with her friends " You are My Sunshine"
Tracey shared with the engaged group , that was a song she sang to her children when they were little and recently for her birthday they had sung it back to her in harmony. 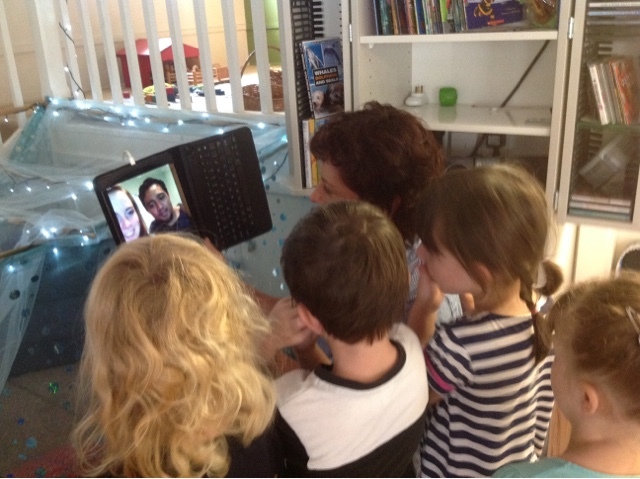 This new word " harmony" created some interest so we decided to explore it further by skyping Tracey's daughter Annalise and friend Ben who are studying through NASDA ( NZ Performing Arts School) and see if we could sing the melody while they created the harmony. We had to persevere with holding the melody,that was easy when that's all we could hear but this new challenge of the harmony being sung at the same time meant we had to really strive for accuracy and listen with real intent.Āe mārika ,How about that! We were good !! A little bit of practice , listening carefully to timing and pitch ,we were ready to perform on Broadway! " Do you want to be a fan? Do you want to be a start?" Jess asked all her friends she gathered up to be involved . We were all of these! 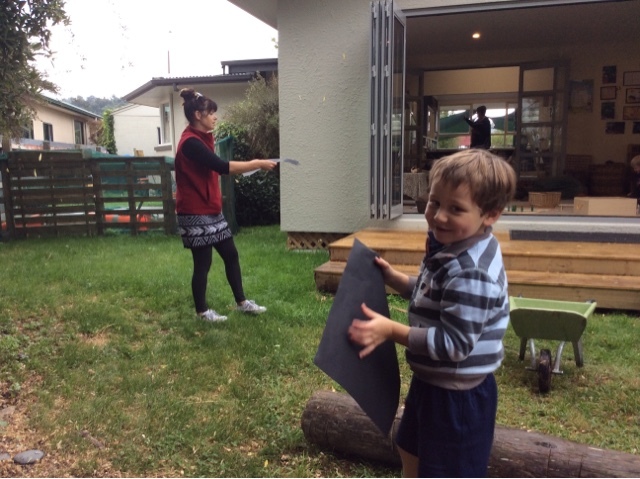 Today when Heather took the tamariki Out the Back, they discovered leaves hanging in mid air, fluttering in the breeze. "How did they get there?" she asked the tamariki. "I think they are spider webs!" was a suggestion. Sure enough there were spider webs hanging from the trees right down to the ground. 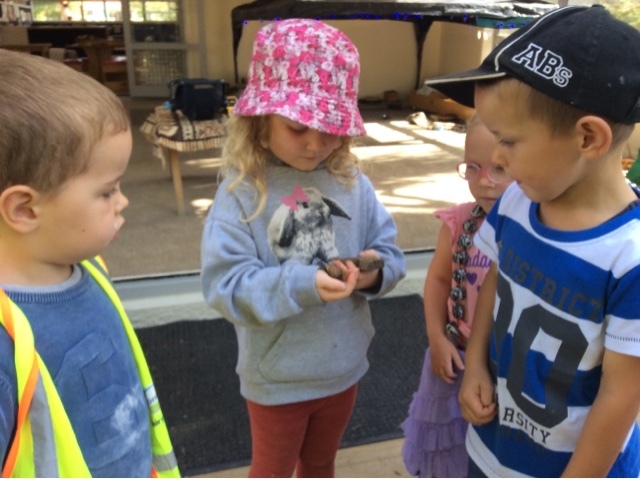 The tamariki tried walking through the webs without touching them to look for the spiders that made the webs. It was quite magical, looking at the webs glittering with dew and the moving leaves scattered amongst them. Tracey suggested we try putting the webs on some black paper and sprinkling flour on them so we could see the pattern more clearly. That’s a good idea. 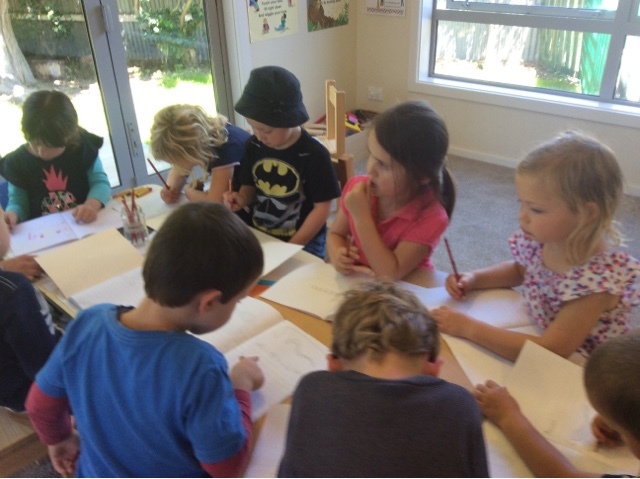 Ke tahi te whakaaro pai. The tamariki tried catching their own webs too. 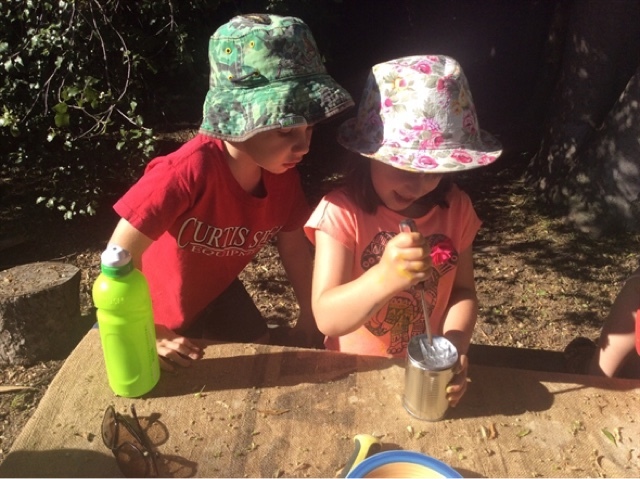 We treasure the time we spend Out the Back as there is always something new to discover and explore. 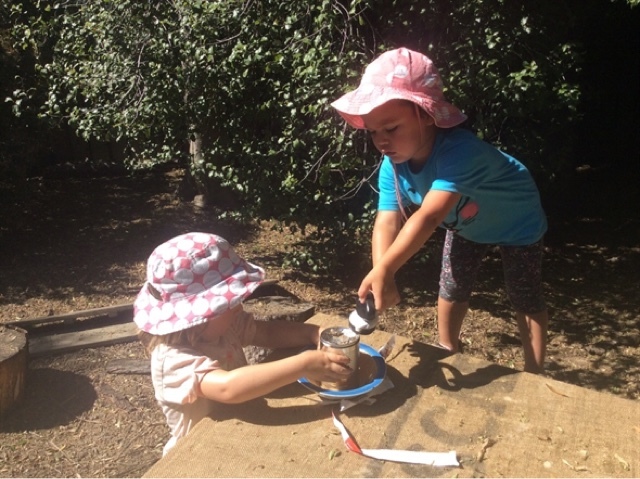 Tamariki have the opportunity to develop the habit of finding wonderment and awe in their natural environment. 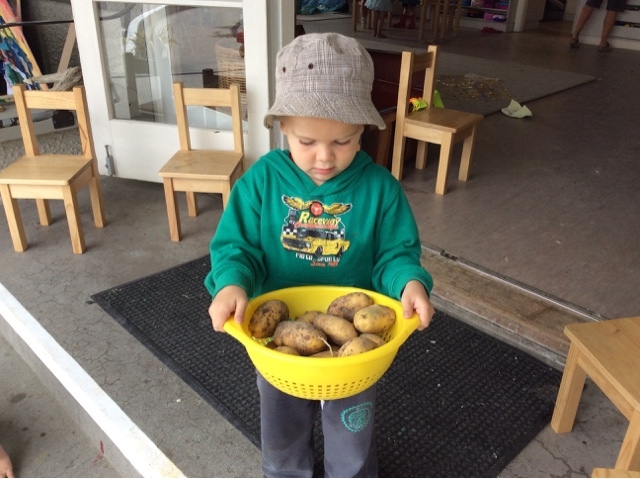 Today was a wonderful day at Kindergarten where we were able to reap the reward of our hard work. 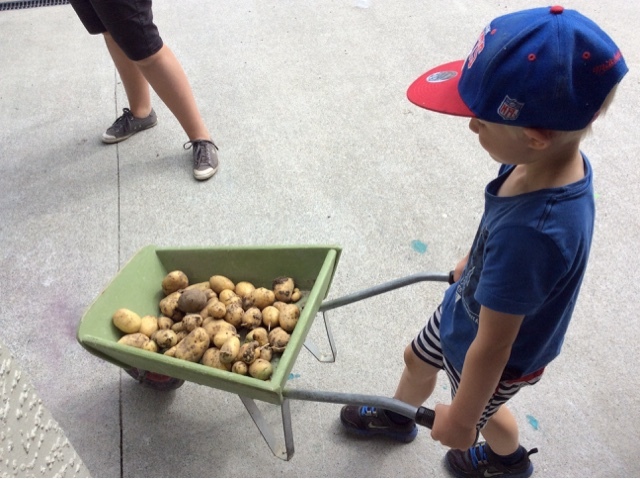 Ashleigh went out to the potatoe patch with the children and together they decided it was time to harvest the potatoes that we planted so long ago. So out came the spades and a digging we went, what we found was so surprising where we had planted one small seed potatoe now there was many wow. Nature is such a wonderful and mysterious thing! 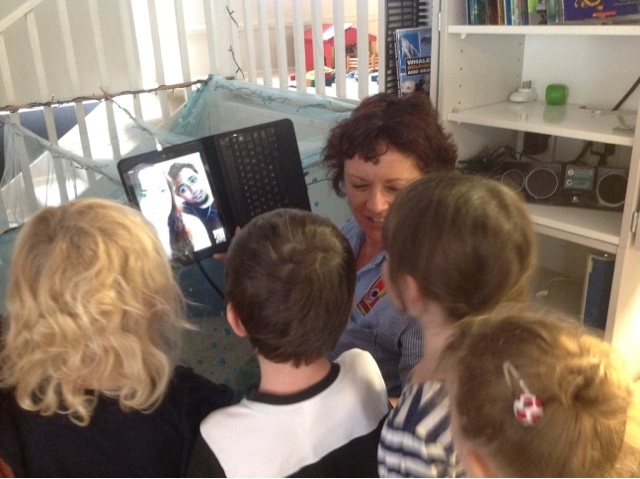 The children responded with such wonderment and awe the expressions on thier faces said it all. 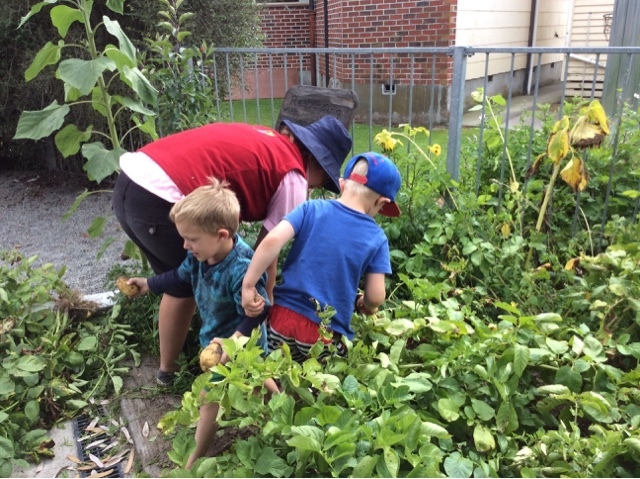 Gardening is such a wonderful life lesson teaching us all the values of precision, time, patience, continued care, persistence, working together and celebration. 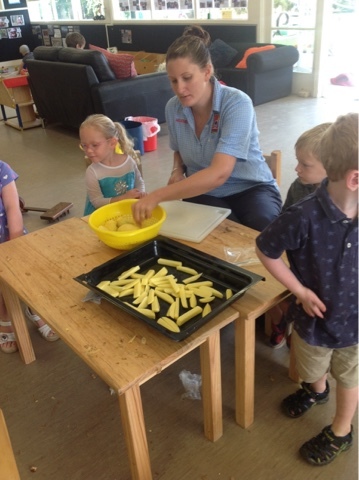 Then on Friday we really got to enjoy our potatoes, we washed them up, peeled them and chopped them into chips. 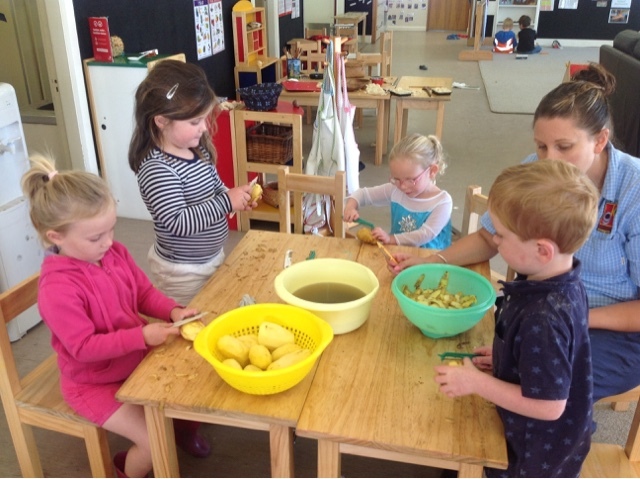 The children helped to prepare the potatoes it was really tricky to peel the potatoes but with some persistence and problem solving we got there in the end, next we chopped them up rubbed in some oil and into the oven they went. Last but not least it was time to eat. Yum Yum they were delishious! What a fabulous process to follow from start to finish. Good things take time! 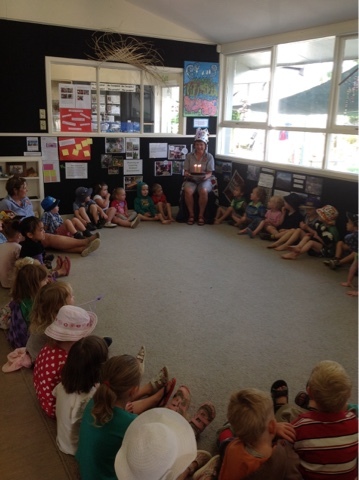 On Monday we shared with the children that it was Tracey's Birthday on Tuesday. This bought about a flurry of activity as we prepared for the big day. 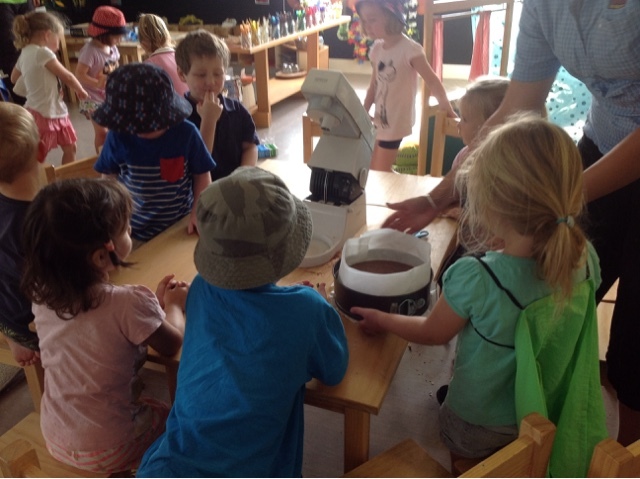 Our first job was to bake Tracey's birthday cake so Heather bought out the baking things and a group of children took turns to measure, count, stir and create the cake. We needed to manage our impulsively to wait for turns and work together. Soon we added the wet ingredients to the dry and then it was ready to go in the oven. This is when the magic happens and the cakes turns from liquid to solid. 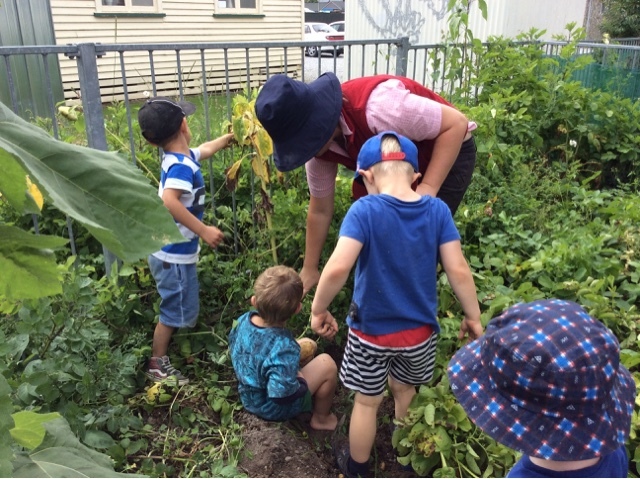 We had to wait and wait but we could smell a most delicious smell wafting through the Kindergarten. But we weren't finished yet, our next plan was to create a beautiful birthday hat for Tracey. 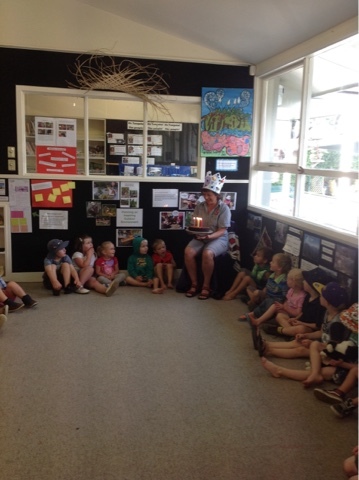 So out came the birthday box and together as a team we collected our ideas, collaborated our thoughts and used everybody's individual skills to create a stunning hat. Then we hid everything away so it was already for tomorrow. We were all set for the big surprise! The next day we were so great at keeping a secret Tracey had no idea about the wonderful celebration we had planned for her. Heather called us in for kotahitanga and we all sat down in our circle and waited for Tracey. We had the birthday chair ready to go. In she came and we were all so excited to give her the hat and cake. She sat on the chair and we presented her with the beautiful hat, she was so surprised and delighted with it and talked about all the fabulous parts of the hat. But we weren't finished yet, out came the cake and we all sang to her, she blew out the candles and made a wish. Well what a lot of planning and preparation but it was certainly worth all our persistence and hard work. Tracey was thrilled and we enjoyed sharing and celebrating her special day. 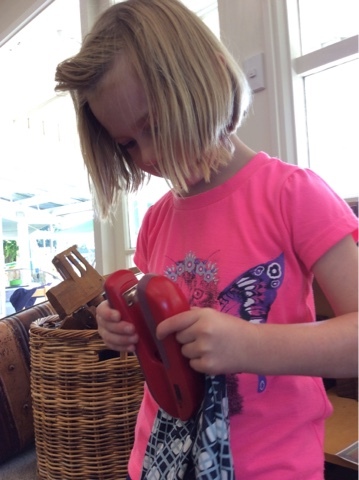 This afternoon as the children began finding different coloured materials to add to a collage project they had started they discovered another creative way to use the large pieces of material. 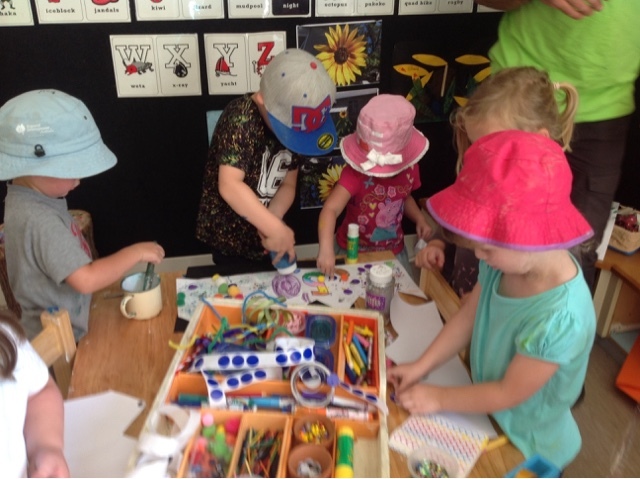 Kindergarten become a design class, creating magnificent new style clothing. 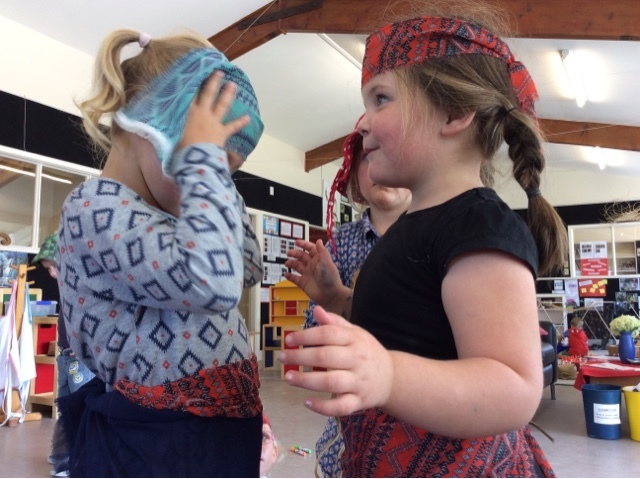 As the children worked interdependently to make head bands, skirts and other clothing items they had to problem solve how to make them stay together. 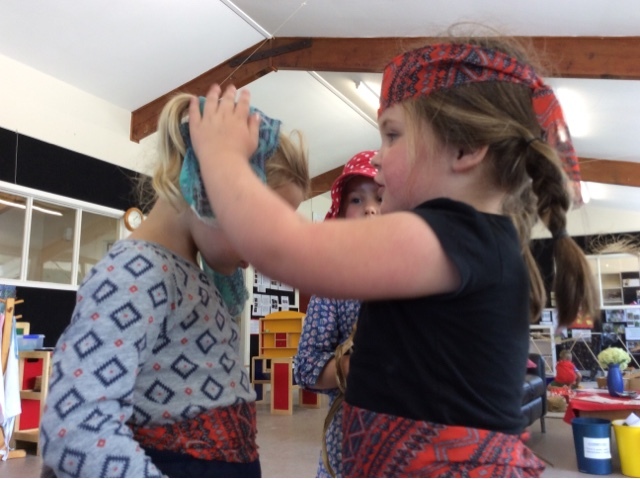 It wasn't long before some of the teachers also had new headpieces to wear fitted perfectly to their heads. 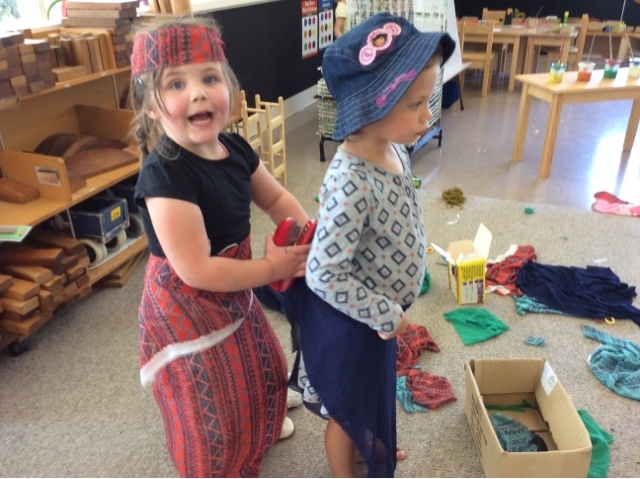 As the children created different garments for themselves and each other they showed manaakitanga/care and respect listening to each other's ideas. This is great, he rawe tēnā! 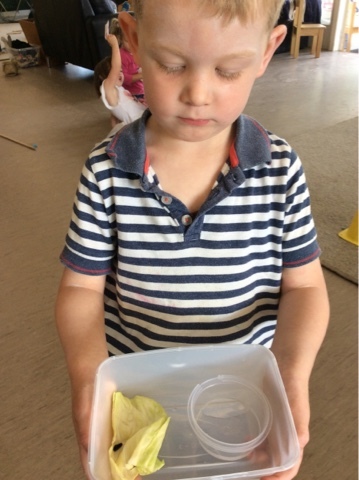 This week the children have continued their interest in bugs, sharing it as their idea of what they are going to do for the day. 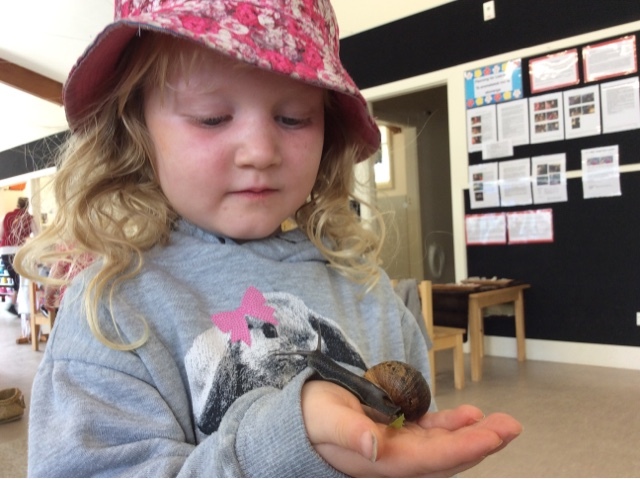 The anticipation for out the back to be open is obvious as they children ask "Can we go out the back so I can find another snail?" 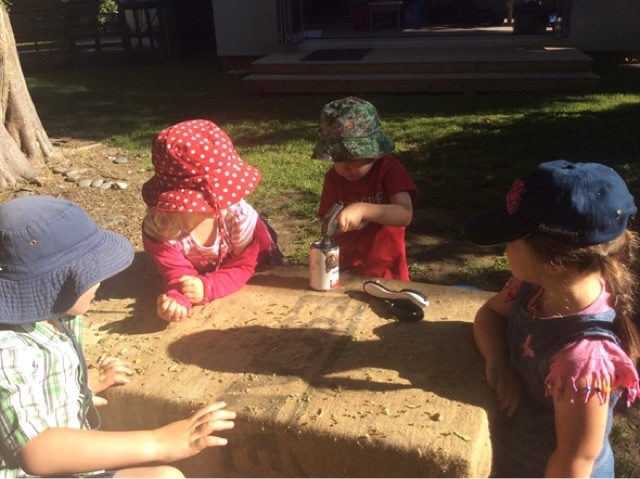 As the week has progressed some bugs and catipillars have been collected from home and brought to kindergarten, this is a fantastic strategy to get engaged with friends once they arrive. This is great he rawe tēnā! 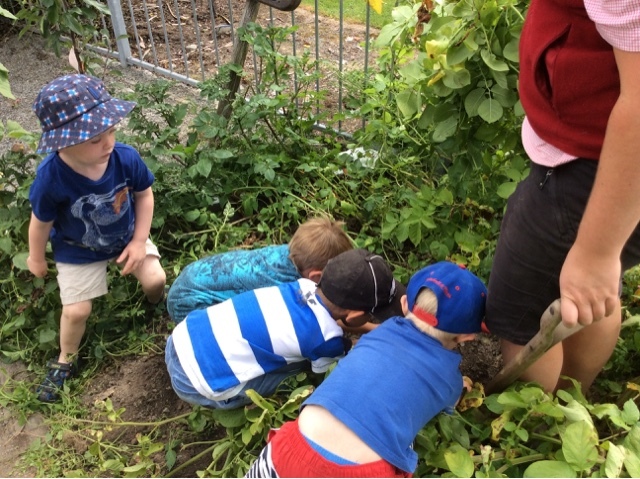 Manaakitanga care and respect is shown to the bugs as the children collect food for the bugs to eat. Feeding the kitten we found Out the Back! 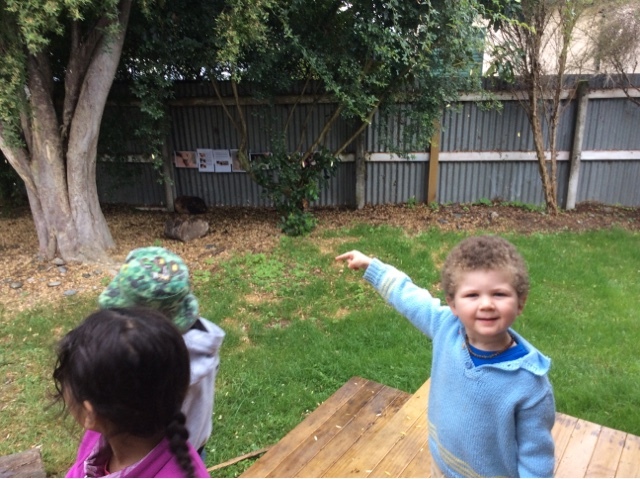 The children spotted a little black kitten Out the Back this week and didn't want it to grow hungry. How were they going to open the can to give the kitten some food? 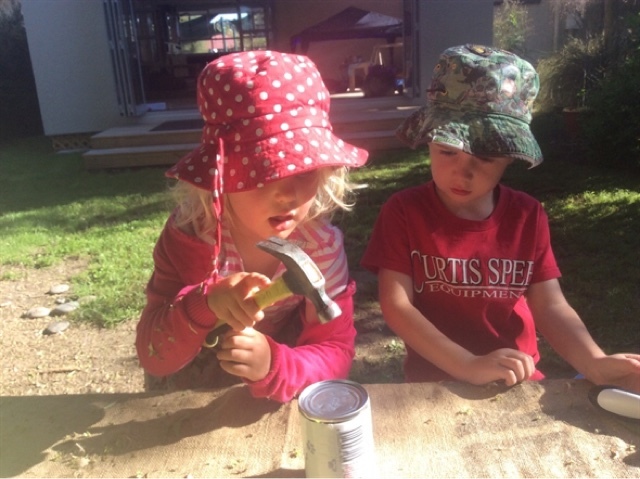 Tracey had a such a wonderful experience listening carefully to the children produce some really thoughtful ideas like hammers, screwdrivers and a can opener that were all tried out. 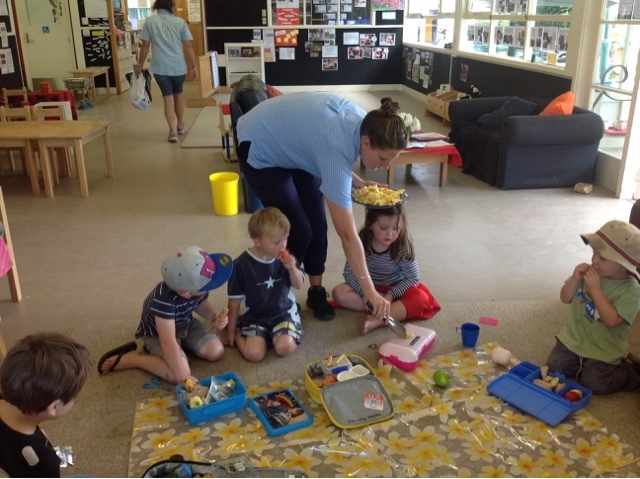 Tracey said the children were really respectful of each other, giving each one time to have a turn. 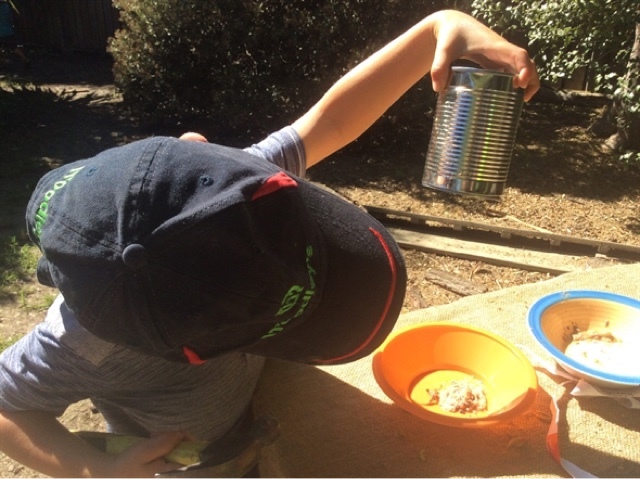 The can had many dents and eventually a few holes emerged for the cat food to dribble through onto the plates. 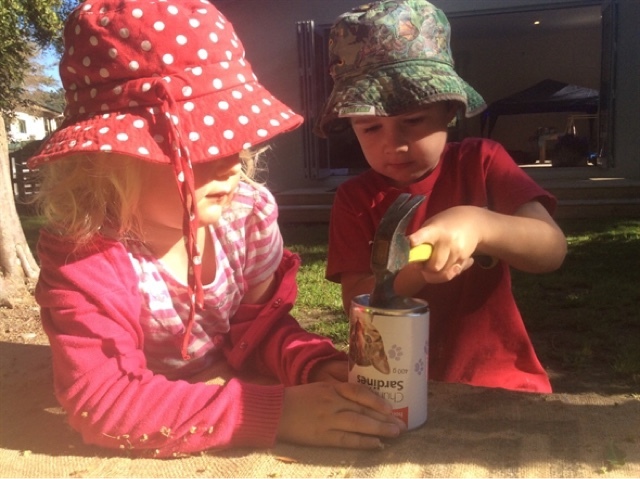 The children have an opportunity to return to the can again and continue to feed the small kitten that just happens to be in our Out the Back area. 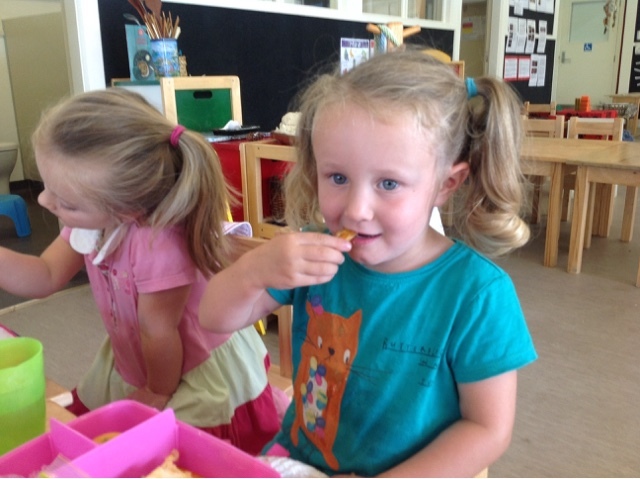 We have introduced a new daily routine that happens after the children have their lunch that we call the Investigators Group. 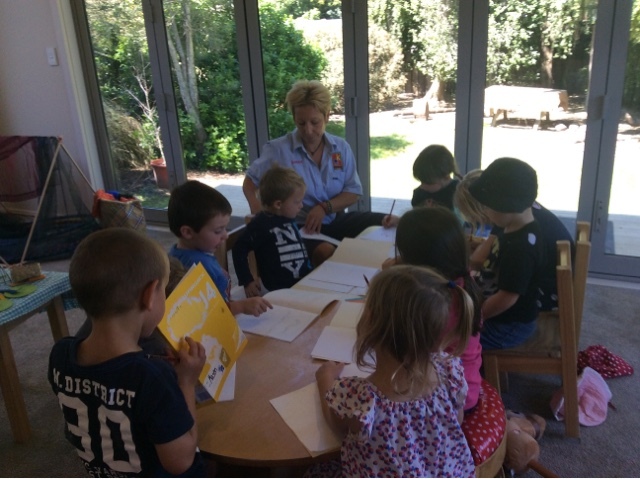 Sarah has been taking the children into the New Room, each one have there own book that they delightedly decorated as their own. 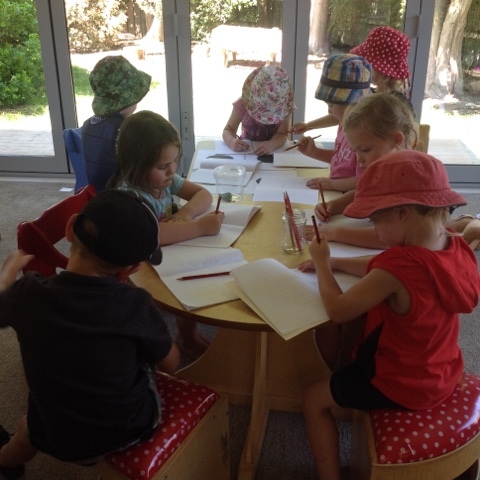 There was lots of pondering and questioning happening as each day they would add to the pages inside. The group have already decided want the want to study and learn more about - bees! 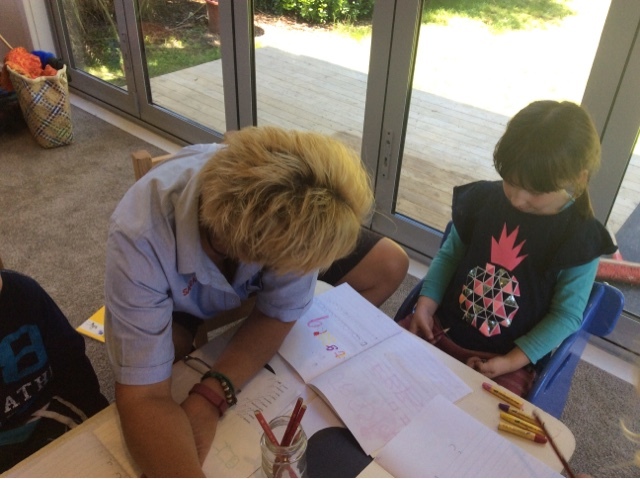 Sarah is already planning the things the group can undertake and Sarah will take them to the library on Friday as part of our Nohonga Tahitanga (weekly excursion) to find some books about bees. 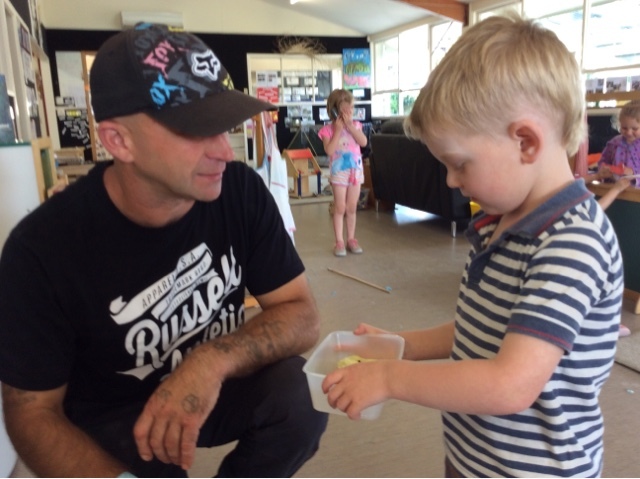 Ka pai tou mahi, you are working well!